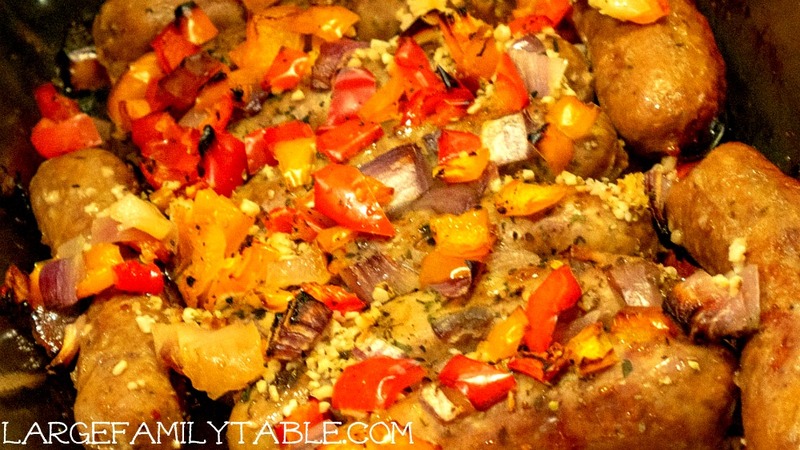 My family loves this Italian Sausage and Peppers Bake! You can use mild or spicy Italian Sausage. I love to use spicy sausage myself. However, on my last Walmart grocery online order, they only had mild available so we went with that. 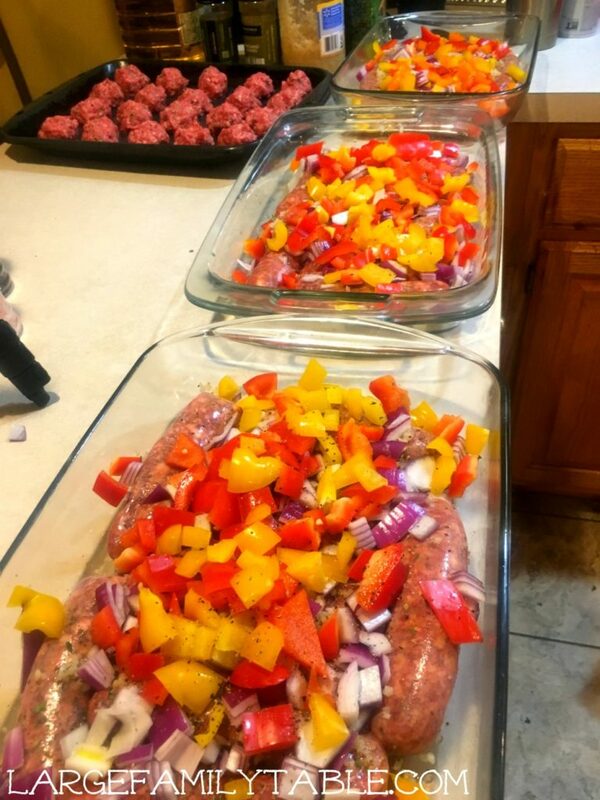 I freezer meal prepped three baking dishes of this Italian Sausage and Peppers Bake during my last freezer cooking day where I made 20 Healthy Freezer Meals for the Instant Pot, Slow Cooker, or Oven. 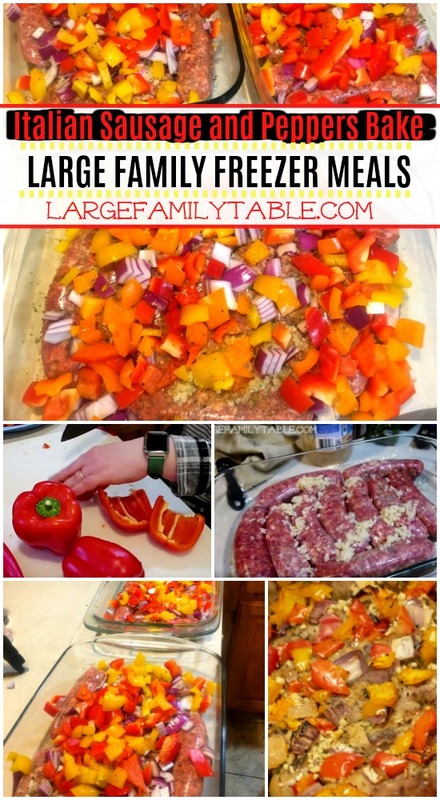 The Italian Sausage and Peppers Bake was one of my easy oven meals. Here is one baking dish with the mild sausage, olive oil, and garlic. Next up was to top the freezer meal bake with peppers and onions, yum! This simple large family freezer meal is gluten free (always double check your product ingredients) and diary free. 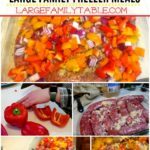 The Italian Sausage and Peppers Bake is also low carb, Keto friendly, and would be a Trim Healthy Mama S-meal if that’s your thing, too! 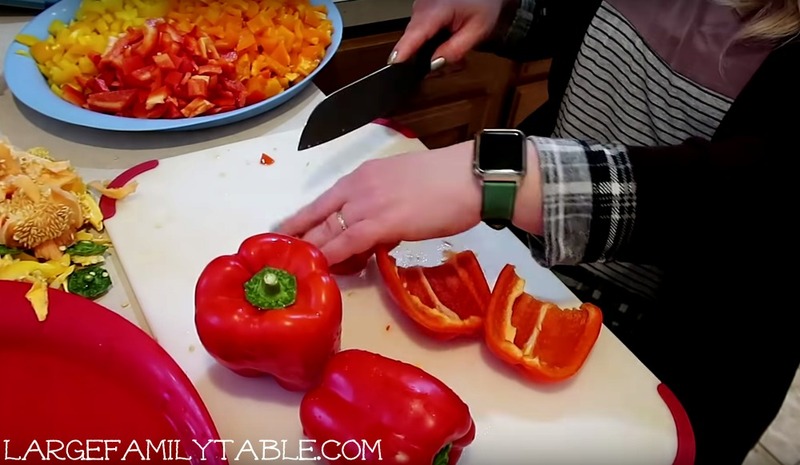 I chopped over 16 colored peppers on my last healthy freezer cooking day! I love to sit and chop. Sitting is my favorite, ha!! 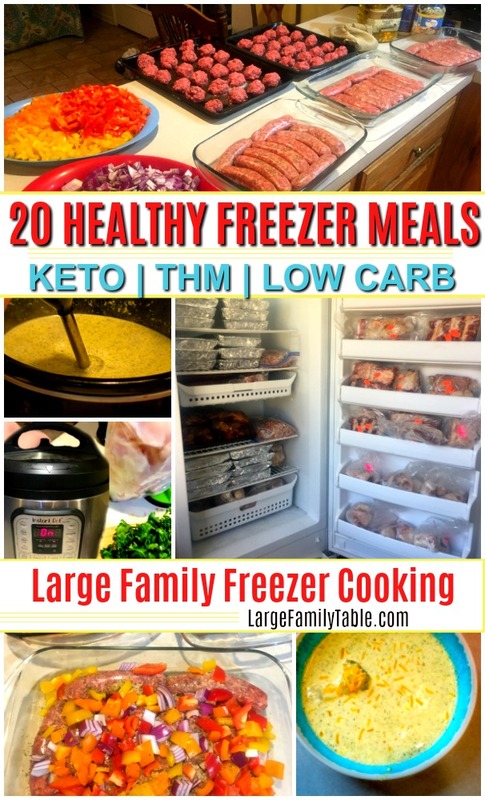 This healthy freezer meal recipe made three large 9×13 baking dishes. You could also use metal pans. If you don’t have pans available you could prep this recipe the same, however place each “pan full” in it’s own gallon freezer bag. When you’re ready to have the meal set your bag out to thaw the night before. Then on cooking day dump the defrosted bag continents into a baking dish and bake as usual. This large family recipe is versatile! Since I was in the middle of developing several new large family recipes the last time my family had this Italian Sausage and Peppers Bake we had Low Carb Broccoli Cheddar Soup as our side dish. Otherwise, we’d have brown rice and a steam vegtable with this meal. Enjoy this delightful Italian Sausage and Peppers Bake with your favorite mild or spicy sausage. Serve with steam vegetables on the side! Divide ingredients equally between three 9×13 baking pans. Wrap each pan with foil and plastic wrap. Correctly label and date your pan. Place in freezer for up to 3 months. Set this frozen meal out to thaw into the refrigerator the night before you’d like to serve it for dinner. On cooking day unwrap the plastic wrap and discard. Bake the meal at 425 for 45-minutes, covered with foil. Then bake uncovered for up to 15-30 more minutes making sure the internal temperature of sausage reaches 165°. Serve with salad and steamed vegetables. 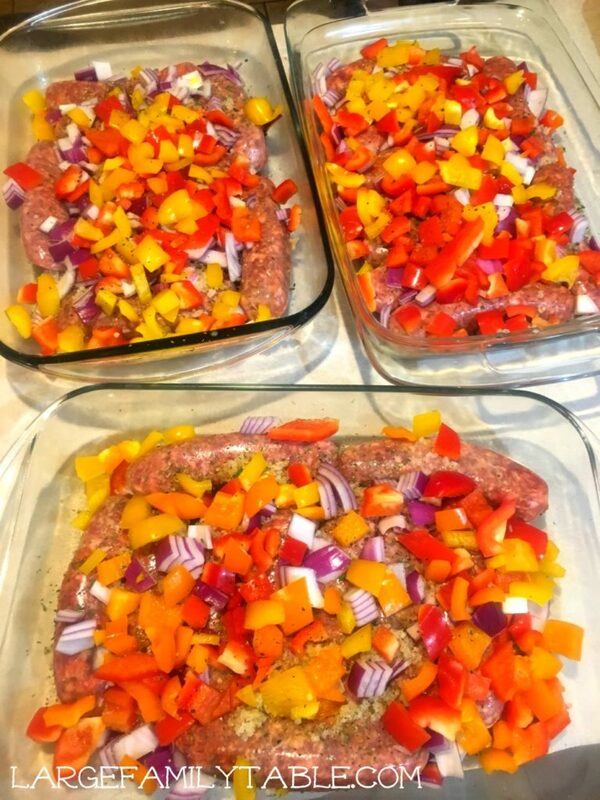 Watch me make this Italian Sausage and Peppers bake in the new 20 Healthy Freezer Meals post with video link and more new healthy freezer meal recipes!